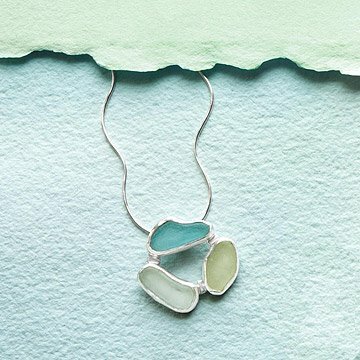 Courtney Gillen's elegant necklace is built around a trio of frosty, sea glass "pebbles." Imagine the shimmering light of sunshine on water, the velvety smoothness of sand under your feet, or the radiant warmth of a clear, summer morning. Designer Courtney Gillen seems to work these very elements into her handcrafted jewelry. This elegant necklace is built around a trio of translucent, sea glass "pebbles"--discarded glass that is shattered, shaped, and smoothed by the ocean before washing up on the beaches of Hawaii, where Gillen seeks it out and collects it. The rounded, organic shapes are framed in handcrafted sterling silver, and suspended from an elegant silver chain. A beautiful collaboration of human ingenuity and forces of nature, each piece has unique variations in shape and color. Handmade in the USA. Clean silver with a soft polishing cloth, the sea glass can be cleaned with a small brush with soap and water. Due to the handmade nature of these items, each stone size,shape, and color may vary slightly from photo. My sister who has been collecting seaglass for decades loved it. Excellent quality and makes me happy when I wear it. I really like this necklace--comfortable, good length, goes with blues, greens, aquas. However, the piece as pictured has much more variation in color and shape than the one I received, which was disappointing (and I note that other reviewers had similar complaints). I realize that it's sea glass, so no two pieces are alike, but I feel that the representation online showed more differentiation in color and shape than what was sent to me. I kept it anyway because it is still pretty, but not quite what I was led to expect. I love the style of the necklace. I do personally wish there had been a little more contrast between the two lighter colored pieces of sea glass. I wear this neckless many days of the week. It is so lovely and always gets compliments. I just love it. Beautiful - I want it for myself! I bought this for my mother-in-law. It looks better than the pic! Great gift, she loved it. The blues are so beautiful, as is the smooth texture. Very well made. Anniversary gift for my wife whom is a vegan...absolutley hit the spot and she has not taken the necklace off in 2 weeks since I gifted it to her 2 weeks ago.